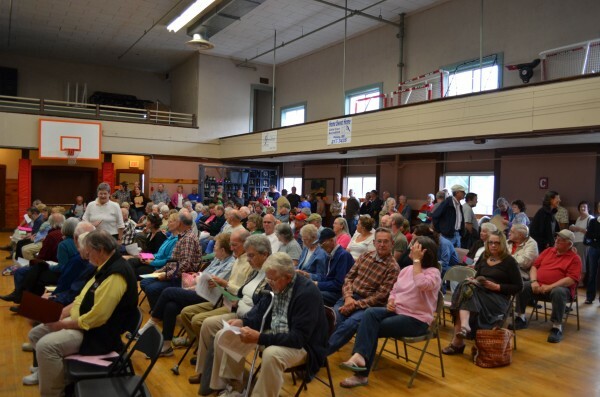 A crowd of nearly 200 gathered in the Dexter Town Hall for a public hearing on a moratorium on east-west corridor development on Thursday, June 13, 2013. DEXTER, Maine — The Dexter Town Council had a rather light agenda at last week’s meeting, but one of the measures was a proposal for a third extension of a moratorium on construction of an east-west corridor through the community. As per common practice, the council moved to hold a public hearing on the proposed ordinance at their next meeting, normally held on the second Thursday of the month. The vote was 4-2 with Councilors Peter Haskell and Alan Wintle opposing the move and Andre Robichaud absent. When the moratorium came up for a renewal vote in December, the vote was 4-3 with Fred Banks — who is now council chairman — joining Wintle and Haskell in casting “no” votes. Haskell and Wintle had lost their re-election bids in November, but their successors didn’t take office until January. “We believe it would be a serious mistake for the town of Dexter to open the door to this enormous project without knowing the specific details, the exact route through Dexter, construction plans, if pipelines or utilities will be included and potential long-term impact to our community,” the letter read. The corridor is a proposed 220-mile toll highway connecting Calais to Coburn Gore, but the primary supporter of the project — Cianbro CEO Peter Vigue — said that the route has not been finalized. Vigue has previous stated that eminent domain would not be used to acquire land for the road’s construction. The letter was signed by Tina Santos, Lisa McKusick, Mark McKusick, Mike Curtis, Wanda Curtis, Dana Cronin, Jill Jones, Karan Sleight, Robert Fritsch, Linda Tisdale and Carole Shoreburn. In other business at last week’s meeting, the council approved a measure to lease the third floor of the Morrison Building, which houses the municipal offices, to the Penobscot Masonic Lodge. Banks asked the council if they wanted him and Michael Blake to abstain “from any vote or discussion on the matter since we’re both members [of the lodge].” But when the council realized that neither of their colleagues would benefit financially from the move, they suggested that they not abstain. The move will eventually bring the fraternal order back to its original home, Banks said after the meeting. The lodge purchased a former church on Route 7 several years ago and remodeled and expanded the building.